Right, time to sign off. An excellent day for West Indies, but a real reality check for this developing England side ahead of some tough summer Tests against New Zealand and Australia. Join us again on Friday when we'll have live text and radio coverage of England's ODI against Ireland. Until then, goodbye. "England are just waiting for Colin Graves to take over. We need an inquiry. I saw him at Yorkshire - he was cross as hell when Yorkshire got relegated. He needs to do something after this defeat." James Anderson led the way in the bowling averages after taking 17 wickets for 306 runs at 18.00. He had a best of 6-42 in this match - his best figures in an away series and England's only five-for of the series. Stuart Broad took 10 wickets at 32 as he found his form after knee surgery. No other England bowler managed 10 wickets in the series, which tells you how the spinners have struggled and how much the team relies on the frontline duo of Anderson and Broad. Joe Root leads England's batting averages with 358 runs at 89.50, featuring a highest score of 182 and knocks of 83 and 59. Gary Ballance weighed in with 331 runs at 66.20, with scores of 122, 81 not out and 77, while Alastair Cook and Ian Bell also scored centuries, averaging 40.36 and 31.00 respectively. Jonathan Trott finished with three ducks and an average of 12 from his six innings, having managed only 72 runs in total despite one half century. Stuart Broad also recorded three ducks and a total of 10 runs all made in one innings. He averaged 2.50 for the series. "Moeen Ali has batted nicely at times and taken a few wickets but he's a part-time spinner. It was covered up in the summer when the seamers were taking wickets but he's been shown up on a pitch in which he's expected to bowl a team out. It exposes the captain and coach because they didn't pick a spinner like Adil Rashid on a turning pitch. It seems like the selectors have a different idea to the captain and coach. They just threw him on the scrap heap after one poor performance in a tour game." Peter Moores on Sky Sports: "Disappointed because we've had a good series and we've slipped up at the end to tie a series we thought we could have won. We were disappointed with 250 first innings but we knew the pitch was going to deteriorate and we bowled very well to get a lead but that second innings cost us dearly. Credit to West Indies, they bowled us out. "Moeen will be disappointed, we know he's emerging as a bowler and he felt a bit of pressure but he will learn from that. If we knew it was deteriorate that much we would have played an extra spinner, a more mature spinner would have been a nice option. "There's a ruthlessness we need to develop, commitment from the lads has been total but we've got to learn some tough lessons." "There were some outstanding performances from West Indies. Curtly Ambrose speaks to the bowlers after each session and gees them all up before each day. The spirit has been outstanding. I didn't think they had it in them to pick themselves up but they have given the West Indies public a glimpse as to what they can achieve. It will take some time and they do some rash things, but the talent is there. There are many plusses for them." "We have a cautious captain and coach, they are not going to change. They don't have any imagination. If Andrew Strauss is the man (new ECB chief), it'll stay the same. He likes Cook. We'll keep on with the same people and things won't change." England captain Alastair Cook: "We came here after Grenada with the opportunity to win the series, played a lot of good cricket in the first day and a half but then with the bat it shows you can lose a Test match pretty quickly. "It's a tough one to take, it shows no matter how hard you keep fighting you can never win a Test match in two hours but you can go a long way to losing it. "When you're defending 190 you need to take every chance and we didn't do that. Bravo and Jermaine played incredibly well on that pitch but the bottom line is we haven't done enough to win this series. "Let's let the dust settle, its not a long turnaround but I think that's good. For the majority of the series we did a lot of good stuff but when the pressure came on we didn't play very well." West Indies captain Denesh Ramdin: "It was a quite tricky pitch but losing the toss turned out well for us. The bowlers came up trumps for us. We didn't bat as well as we wanted in the first innings, I was a bit worried but the five early wickets in England's second innings really put us in a commanding position. Darren Bravo and Jermaine Blackwood batted fantastically well. We have young blood and they are very hungry for success." He says: "We played some good cricket throughout this series and to get a first-innings lead we thought we were well in the game but they did a great job of knocking them off. There were periods we thought we would be in with a chance but Bravo and Blackwood played really well. "I felt like I bowled well and contributed to the team's success but disappointed we couldn't quite get over the line." West Indies batsman Jermaine Blackwood is named man of the match. He says: "I always try to play my natural game but I have to adapt to the situation. Sometimes I get out playing my natural game: not every day it comes true, but most of the time it does. Darren Bravo just kept telling me to stay positive and take it 10 runs at a time. Each Test series I'm learning, so it's a good sign for me." "It has been the worst spin bowling I've ever seen from an England team, possibly any international team, in the 50 years I have been commentating." T.C.H: My wife, Sarah, and I were meant to be starting our honeymoon in Barbados at the Test Match tomorrow. A beach beckons! "A big point in the game was that missed stumping when Blackwood came to the crease. If he'd stumped him then, it would have opened up an end. The wicketkeeper (Joss Buttler) saw it all the way, it was regulation." Goonerh1: England tried to put together a team with bowlers who can bat and batsmen who can bowl. Unfortunately most of them did neither. "You always feel that if James Anderson doesn't get wickets, who else will? He can't do it all the time. Even if he bowls beautifully you cannot expect that every time he bowls the batsman will nick it. Somebody else has to be stand up and be counted. Stuart Broad bowled well for a time and England were still in it, but then Bravo, who looked to be fretting a bit, played well and I can't praise him enough." Jack of all trades: Couple of good bowlers and good batsmen, this Windies side have promise, would be even promising with Bravo, Gayle and Sarwan. kdios: Blackwood showed great composure after two horrible outs in second innings of previous matches. "Stokes and Buttler played little gems this morning - showing solid defence and attacking when they could. They were marvellous. Buttler played some gifted shots, he should be moved up the order. The only minus from a batting perspective this morning was that Stuart Broad is scared of the ball. Somebody has to talk to him because he can bat. Now I don't expect him to make any." Peter Blow: £180 for two tickets to Lord's Day 4 of the Ashes. It'll never get that far under Moores. No frontline spinner in Barbados? Joke. Sue: England have some great players. They just need a great coach to inspire, motivate and bring out the best in them again. "This will build character and belief in the West Indies. It will be good for new coach Phil Simmons. Even for somebody like my 15-year-old son, it will seep into the deeper consciousness. We've been down in the dumps for a while but this is like the good old days - West Indies winning inside three days." Stephen Tue: As much as that was a poor defeat, I think we have to say that this tour has brought more positives than negatives. James Vincent Mill: At the end of the day, the players have to perform. Moores et al can't bat and bowl for them. Very disappointing from some. Sally Smith: Funny how people criticise this team, when they were praising the win in Grenada just over a week ago... short memories. "England were not assertive enough in their batting, they just didn't score enough runs quickly enough. Trott and the way he got out to that short ball from Gabriel set the tone for the match." Quite simply, this was a Test match, and a Test series, decided by a dreadful performance by England in their third innings. They were well ahead of the game, but they let it slip. The top order were blown away, and a few lower-order runs from Buttler and Stokes this morning proved wholly inadequate. Where will the inquest focus ahead of the summer Tests? Well, it looks like Jonathan Trott will be replaced at the top of the order, but there are also huge question marks over England's bowling: particularly the variety of the pace attack, and the effectiveness of the part-time spin duo of Moeen Ali and Joe Root. "This is West Indies' second win in last 29 Tests v England since Birmingham 2000 (Lost 18, Drawn 9)." "All the caterers at the ground are upset - they've lost two days of work because of England. Obviously they are joking. Everyone wants to go to the beach now... come on, let's go." Greg Hill: We are going to get destroyed in the Ashes this summer! No way Moores is the man to take us forward. Guto Ifan: If this is what England do against a 'mediocre' team, I'd hate to think how they'll do against a decent team.. say New Zealand or Australia. Samuel Cardwell: No reason for big changes. Cook has batted and captained well. Need a spinner, an opener and a seamer, but still a good side. "England have to lick their wounds. 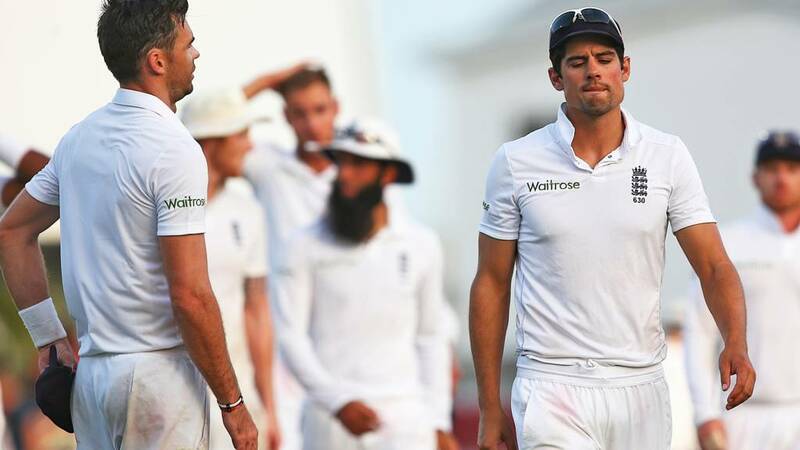 The tour was on such a high a few days ago with Jimmy Anderson's heroics in Grenada but now it's ended on a damp squib." "This is in no way a mediocre West Indies side, they are a developing side who have shown a lot of character. It's a famous win for the them, it will mean a lot to them. It's a chastening defeat for England, which is all down to their batting in the second innings which wasn't good enough. The bowlers huffed and puffed but they couldn't keep the pressure on." Jermaine Blackwood clobbers the winning runs, and West Indies have squared the series. A hugely disappointing defeat by England, but West Indies batted brilliantly to chase down that target in really testing circumstances. This is a side that has come of age in this series. Darren Bravo and Jermaine Blackwood were outstanding. "There's a shocked silence. It's a low full toss which he's smacked to the fielder. Everyone thought that was the game. Baby Bravo, the younger of the two brothers, has won the game for his team today." "West Indies are going to remain the only team - other than Bangladesh - not to have lost a Test when chasing less than 200 to win." Andrew Morris: England have to blame themselves. They threw away a winning position with poor team selection and rash shots. Moores has to go. "The Test slipped away yesterday. England's second innings started badly and just got worse. Even a couple of cameos from Ben Stokes and Jos Buttler didn't get them to a decent total." "Darren Bravo is playing golf now, showing his intentions. England look beyond tired now... they look beaten." This is all over. England are going through the motions now, running on autopilot with that empty feeling in the pit of their stomachs. Blackwood drills Moeen for four through the covers, and then Bravo launches him for a huge six, right into the party stand. Never have people looked so happy to be pelted with a heavy wooden missile. "As Geoffrey would say... that's only out if your Dad's umpiring." And he is. Home by yards. "This could be the moment the Test match turns... direct hits so often are out." "It's been an innings which has grown in stature from Bravo. He has been the man to hold it all together for the West Indies." Rob Meech: I think it's fair to say that jobs are on the line for some of England's players and management here. Merlyn: Look on the bright side England fans, Graves promised a clear out if we didn't win this series. So something must happen. "Put two wickets on the score and then you're down to the tail and every run will seem like a mountain. It's not done yet... but that was a disastrous over for England." "England are starting to look tired. They have over-bowled their seamers because their spinners are not able to bowl as much as they would want." Alastair Cook brings Moeen back into the attack. Given how unreliably he has bowled during this match, that is the gamble of a desperate man - but then again Moeen does have a knack of picking up wickets. Bravo adds another single with a cut to point. "It's always easy for someone who hasn't played top-level cricket to call those that do 'mediocre'." "I'd certainly be disappointed if we don't win the series, because I am pretty sure the West Indies are going to have a mediocre team. "A lot of their stars are going to be playing in the Indian Premier League, not in the Tests, so we should win. "If we don't win, I can tell you now there will be some enquiries why we haven't." told BBC Radio Leeds before the series. "West Indies have never failed to chase a fourth-innings target below 200." Former West Indies Test captain Darren Sammy: One by one will full the basket. #Ibelieve #wibelieve lets do this. #rally #WIvEng. England suddenly look flatter than a pair of slacks that have just been through the trouser-press. Another chance narrowly eludes them, a mistimed back-foot punch from Bravo just dropping short of the outstretched hand of Joe Root. Anderson aims a petulant kick at the ball at the end of another thwarted over. "There's a sense of urgency and desperation amongst the Barmy Army as they try to urge England on. You can also see plenty of home flags fluttering now as well." Stuart Broad is so often the lightning rod for criticism in this England side - can he be the hero? The camera picks out Peter Moores on the balcony - ashen-faced, no doubt thinking of the tough questions that will be coming his way if England throw away a series win here. Broad keeps Blackwood honest with a maiden. "These two young batsmen have to stay there and keep communicating with each other. Keep telling each other to keep their heads and focus." Nothing is going England's way here. Cook takes a man out of the slip cordon to station him on the drive, and with crushing inevitability, Bravo gets a thick outside edge to Anderson that flies, almost mockingly, straight through the vacated area and away for four. Just 50 needed for West Indies now. Matt Clough: If Moeen was selected over Rashid on bowling merit, what was Rashid bowling in the nets? England are desperate, desperate for a breakthrough here. Their hopes of a series win are slipping away from them. West Indies should get over the line from here, but they're not used to winning Test matches - the crawl towards that winning post will be an agonising one, especially if they lose a couple more wickets. Blackwood shaves another run off the deficit when he squeezes out a Broad yorker for a single. "You can feel both sides of the crowd living every minute of this game. This has been an outstanding Test match." James Anderson returns to the attack with only 59 runs needed for West Indies. Is this Cap'n Cook's last throw of the dice? Even Jimmy can't shut off the taps though, with Blackwood adding three to the total with a dab through gully and a single to cover. "England need at least two wickets this evening. If they don't get them it will be even harder for them tomorrow." He's got six centuries, but I'd venture this is one of the best knocks of Darren Bravo's Test career. He brings up his fifty with a four through backward point: a gritty, disciplined, talismanic knock from the Trinidadian. Another big over for the West Indies, nine off it. Craig in Edinburgh: I think England will get them nine down and find themselves about 20-30 runs short and will be kicking themselves if they end up drawing the series. Bravo continues to creep towards what would be a highly impressive half-century with a drive through mid-off for two and a single through square. Blackwood then picks up three with a steer through backward point, Stokes leaking like an old pair of wellies. Rob Porter: If England go on to lose this they have no one to blame but themselves. Desperately poor batting and not enough bowling depth. Drinks are over, and just the like the bucking bronco's would-be conquerors, the batsmen have to get back on the horse. Stuart Broad, England's stand-out bowler today, has the ball. Bravo gets going again with a single to fine leg. There's no better view in the ground than the BBC Test Match Special commentary box in Barbados as Aggers and Geoffrey Boycott describe a thrilling climax to this Test. Oblivious to the tension enveloping the Kensington Oval, refreshed punters enjoy themselves on the bucking bronco in the stands. The bronco has thrown off a few victims in the last few minutes, but England's bowlers are struggling to throw West Indies off their stride here. Bravo adds a single, and it's time for drinks. "I think the next 30 runs are pretty important. If West Indies get to 150 they can start counting down then." The tension is mounting here. Jordan wants a caught behind against Blackwood, but Billy Bowden says no, and England have no reviews left. "That stumping chance was a big miss (see 20:28). It was straightforward and the ball bounced at a normal height. Buttler had a long time to see it - and that could have been the end of Blackwood." "West Indies have picked up some runs without many hiccups but it can change quickly. You will get moments when it ebbs and flows. You have to keep positive. Some of the West Indies players are a bit flaky. They've not been tested like this." Every single boundary save, every single missed shot, every single drag-down could be the difference between victory and defeat here. Ben Stokes saves three potentially priceless runs with a great stop at point. "If England could get a wicket I feel Stuart Broad will come straight on and he could run through three or four the way he's bowling." West Indies are just beginning to edge back into the ascendancy. Moeen just can't keep the ball on a good area, he drags one down and Blackwood sends a huge slog-sweep into the stands at deep midwicket. "I'm sticking with England but this stand is developing nicely for West Indies." James Standen: I thought Stokes was an all-rounder? So why have we not seen him in 41 overs? Bravo dashes through for a sharp single, then Blackwood pulls a short delivery from Moeen to fine leg, where it's brilliantly saved by Broad. Such a premium on every run here. "I still think it's fairly even, another 100 runs is a lot to get on this pitch, especially with the way they are batting at the moment, it could take another 80 overs!" Chris Jordan comes back into the attack. West Indies have scored just 22 runs from the last 17 overs, and 10 of those came from one set of six. Squeezed. Jordan keeps them under the pump with another maiden. "Good to see Moeen Ali back, he's not a had a great game with the ball, that lack of bowling over the winter beginning to tell." Moeen returns as shadows begin to encroach across the Kensington Oval. Can the sometimes erratic spinner keep it tight after a nagging spell from Joe Root? For the moment, the answer is yes: just a single to Blackwood from his latest over. 100 needed for the Windies. Lewis Powell: Anyone else hoping for the wettest summer ever... all five Ashes Tests washed out and England saved from a humiliating summer. Bravo plays out a maiden off Anderson. On we go. Jermaine Blackwood does a good job of affecting a responsible air most of the time, then surprises you with a moment of utter youthful impetuosity - the sort of man who could probably persuade you to leave him in charge of a sports car, or a box of firecrackers, and you'd only realise your mistake when you saw the inevitable puff of flames. He's back in responsible mode for the time being, jogging two off Root. Graham Mooney: #thingschrisjordancouldcatch: A diving catch at first slip off Chris Jordan's bowling. After that kamikaze mission, Blackwood has his sensible shoes on again, and plays out a maiden off Anderson. Ohhh, that's a huge let-off! Blackwood has a brain explosion and dances down the track to Root, misses completely, and Jos Buttler makes a hash of a simple stumping chance, a real cymbals-for-gloves moment. That really was a ridiculous shot given the circumstances, and the wicket-keeping wasn't much better. Ben: Chanderpaul. Whenever he was at the crease you thought the Windies had a chance. That's how important he was. A true great. West Indies keep chipping away - Blackwood works Anderson to long leg for two, then adds a single wide of cover. "I like the field from Alastair Cook, he's kind of saying to Blackwood 'ok hit the ball over the top'." Bravo tucks Root behind square for one, before Blackwood gets off the mark with a nudge to backward point. Rich in Leeds: England deserve to lose this Test. Spineless team with cowardly selection partly to blame. England need rid of Moores. There are new heroes waiting to be made here for West Indies if they can seize their opportunity: Jermaine Blackwood could be one, Jason Holder might be another candidate. But it's a real test of mettle for this inexperienced lower-middle order. Blackwood plays out a dogged maiden against Anderson, following a leg-bye. Ben Turner: #thingschrisjordancancatch A great white shark using his bare hands. A chorus of 'Jerusalem' ringing out around the stands - England's fans believe their side are in the ascendancy here. Bravo pulls Root in front of square and only narrowly evades the leaping Stokes at cover. Kyle Waite: Chanderpaul was the wicket. Definitely backing England now. Jermaine Blackwood is the new man - a batsman with only two gears: first and warp-speed. He resists the urge to throttle up for the moment, and plays out five respectful dots to Anderson. "If that is his last innings it's a horrible way to end for Chanderpaul, who has given so much loyal service." The pendulum swings again! The limpet is prised out, and it's a real freebie for England. A loosener for Anderson, well outside off, and Chanderpaul, shuffling across with that idiosyncratic stance, somehow manages to deflect it on to his stumps. Is that the end of one of the great Test careers? And Bravo pumps Root's first ball back over his head for six! What a statement of intent. And then he hammers him through the covers for four for good measure. Bravo out of the traps like a whippet after tea, the cucumber sarnies clearly not weighing him down. two-Test series against New Zealand, starting on 21 May at Lord's, plus five one-day matches and a Twenty20 international. the Ashes and a certain Mitchell Johnson. That five-match series gets under way in Cardiff on 8 July. A magnificent session of cricket, and an enthralling, finely poised Test match. West Indies have taken a significant chunk out of that target, scoring freely at times during the afternoon, but England have given themselves a huge sniff with three wickets. Simon Saunders: #thingsChrisJordancouldcatch: A train that left the station 10 minutes ago. James Levy: #ThingsChrisJordanCouldCatch, Lewis Hamilton, using Rosberg's Mercedes. "Wonderful cricket, both teams are still in it. They'll both be thinking they can win. Great game of cricket. I thought England have stuck at it really well and the good thing is the spinners have bowled really well so the captain has been able to gain control." Stuart Broad rattles Chanderpaul with a sharp bouncer which gets through the batsman's attempted pull and strikes him on the shoulder. That sends the Crab back into his shell and he blocks out the rest of the over. That is tea, with this match right in the balance. "They're going nowhere, slowly and slowly it builds up the pressure." Thomas Measures: Can sense a collapse coming. Broad will produce one of those magic spells. Merlyn: Game on now. Broad I take my hat off you've bowled well this match. Long overdue. What a moment for Shivnarine Chanderpaul, the grand old man of West Indian cricket who may even be playing his farewell Test innings - and he could hardly have asked for a more suitable scenario to give us one last masterclass in obduracy and resilience. Bravo plays out a maiden from Joe Root - that's five maidens in a row now, West Indies are stuck in the mud here. "The ball cut Samuels in half; it was through him in no time. I think he is getting back to his best is Stuart Broad. He's one of the England players that can go home very happy - with his bowling that is - I'll not talk about his batting." Magnificent from Stuart Broad! He set Marlon Samuels up, getting the ball to shape away from the batsman and then sneaking an inswinger through the gate. Samuels was so comprehensively defeated by that delivery that he ended up down on his knees. That's one of West Indies' key batsmen dismissed, and this Test match teeters on a knife-edge again. "I think Bravo is ready to crack, he's been there a long time for 15." Ooh, Darren Bravo nearly gives it away with a swipe at Joe Root which lands agonisingly short of mid-on. There's real turn here for Root and he draws a false move from Bravo again, under-edging one that fortuitously evades the stumps. Just a hint of trepidation on the faces of Alastair Cook and Jos Buttler. England need to end this stand pronto. Stuart Broad is giving it his best shot, sending a leg-cutter just past the groping bat of Marlon Samuels and then getting one to just hold its line and defeat the blade again. High-class fast bowling, but no rewards for Broad as yet. "If England are going to win there's going to have to be a collapse, a frantic half hour, that changes the momentum." The Golden Child, Joe Root, enters the fray to provide another spin proposition. He begins with a good maiden to Darren Bravo. Chris Jordan is off, and Stuart Broad is back. Samuels produces a lovely, elegant flick through midwicket, just stroked off his toes with languid, easy grace. Then Samuels steers one through point and Ben Stokes, a man who never seems far from a fit of rage, is absolutely furious with himself for failing to stop it with a sprawling dive. Eight off the over, West Indies going along at a decent clip here. "England have to keep thinking, add two wickets to that score and then it's not so easy to get to 192." England can't afford too many freebies from Moeen but the spinner shows no signs of having conquered his propensity to send down one filthy delivery per over. Too short again and Bravo swivels and hoicks him over mid-on for four. Bravo has a rush of blood next ball though, driving loosely, and he's fortunate to see the ball just dip under the toe of the bat. Chris Darby: If the Windies win this then Cook should resign the captaincy and Moores should quit as head coach. Neither of which will happen. Darren Bravo brings up the West Indies 50 with a cute little nudge off his hips down to the fine leg boundary. Hands on head from Jordan. Sub fielder Adam Lyth then distinguishes himself with an erm, lithe, piece of fielding to stop a Bravo cover-drive, but the next shot squirts a little squarer and brings two. And then Bravo pockets two more with a thrash through the covers. Eight off the over, a good one for West Indies. Scott Lennon: #ThingsChrisJordanCouldCatch: A Cold in The Sahara Desert...Mayweather in the ring last night. Moeen continues. There's a bit of uneven bounce on display - the odd ball is just keeping low and defeating the West Indies batsmen. Joe Root manages to prevent a single with a really good stop from Marlon Samuels. Owen: All this talk of a quick bowler needed- I remember a certain Steven Finn being England's next big thing... When does he come back? Samuels and Bravo inch West Indies closer to the target with a couple of singles off Jordan. "It's going to be a total pressure cooker of a finish, you can feel it." Ooh, that's another horror from Moeen, half-tracker that Samuels bludgeons for four that only just avoids decapitating the man at short leg, not for the first time. But Moeen comes back really well, producing an absolute doozy that grips and spins past the tentative prod of Samuels. Good contest, albeit not one that you'd necessarily want a front-row seat at short leg for. "This is a very important innings for Marlon Samuels. He has strutted around looking cool, this will show whether that's all front." Damian Humphrey: If England win this - and I think they will - the difference between the sides will be Cook's century. Chris Jordan has seen more old leather in this series than a Camden jacket trader, but he looks an entirely different proposition with a newish ball in his hand. He scuttles one just past Marlon Samuels' off stump, then induces a mistimed drive that brings the batsmen a slightly fortunate three. "Moeen just has to let the pitch do the talking." Maddy Raman: Jordan must sneak a device in the ball that guides it to his palm. The only plausible explanation for his wondrous catching. Moeen continues. Samuels is off the mark with a single to square leg, and Bravo opens his account with a chop through the covers. Richard M: A few minutes ago West Indies had Hope. Now they have no hope. Well well. Marlon Samuels is the new man, and with Shiv Chanderpaul not at his best in this series, you feel much depends on this partnership between him and Darren Bravo. Jordan keeps the pressure on with a maiden. "Five minutes ago it looked as though they would lose by 10 wickets. Don't underestimate what that will do to the dressing room. All of a sudden that looks like a 300 chase to those boys." "He's a phenomenal slip catcher, one of the best I've ever seen to spin." This is getting ridiculous. Chris Jordan has clamed yet another ridiculously brilliant slip catch to get rid of Kraigg Brathwaite. Moeen pushes one on with the arm, Bravo nibbles at it, and the human Venus fly trap Jordan swallows it up one-handed. England on the march. "A bright future for young Hope but it was an unfamiliar position for him. This is a test of Darren Bravo's character, he needs to work hard. He looks better when he is rotating the strike." It looked a little doubtful, but DRS shows the ball thudding into the leg pole, and England have their breakthrough at last. Hope's debut is over - he showed promise, but two cheap dismissals. "My instinct was it was going down leg-side but Billy is not having the best Test match." Now then, now then. Jordan has hit Hope on the pads again, and this time the verdict is out. Hope wants a review though - is it going down leg? Hamzah Patel: Moeen Ali to win this game for England. Mark my words. Now then, time for Moeen's off-spin. He bowled poorly in the first innings and England need him to up his game here. His first ball is inauspicious, a full toss which Brathwaite clips to deep midwicket for a single. The batsmen rotate for a couple more low-risk singles. "I'd like Jordan to be a little bit more aggressive at Shai. You have to take wickets, give him a bit of short stuff." Chris Mitchell: Are we seeing the end of Cook's captaincy here. Panicky and wasteful reviews. One of him or Moores will be axed when we lose this Test. Hope survives the rest of the over. No luck yet for Chris Jordan but he has looked threatening. "That was out all day in my book. Come on Shai Hope, grab these opportunities. You're not an opener but grab these opportunities." "West Indies need to consolidate and let their talents show." Jordan almost scuttles one under the bat of Kraigg Brathwaite but the opener just about gets the portcullis down in time. Two consecutive maidens though, pressure just building on West Indies. Nope, bad review, that one came off the thigh-pad. That's the first decision of four that Billy Bowden's had reviewed today that he's got right. Matthew Coote: If you were to do an all time England XI Cook would definitely be in it, but his captaincy is shocking. You just feel nervous for debutant Shai Hope in this situation - like a newborn gazelle in a nature documentary, you can watch him gambol along happily enough without ever quite shaking that sense of imminent jeopardy. But he's playing nicely so far - he blocks out another over from Stuart Broad sturdily. Don Paulo: If WI win this, I confidently predict nothing whatsoever will change in the England set-up. Brathwaite keeps the scoreboard ticking with a was-that-deliberate-or-not fiddle down to third man. Not sure, but either way it brings him four. "Why is Root there at slip and not Jordan? You have to have your best fielders in the correct positions. Jordan is in the outfield." "If Moeen Ali is nervous about bowling, I'm also nervous for him. We'll find out a lot about him when he does come on." Young Shai Hope is showing real obduracy here, playing Anderson with a straight bat, and if he's feeling uneasy about being stuck on 0, he's not showing it. After 15 scoreless balls, he finally seizes his chance - Anderson drops short and Hope stands tall and cracks him off the back foot through the covers for four. Freddy Harper-Davies: I can't be the only one thinking that West Indies will probably get this target without losing a wicket? Moeen shows a real turn of pace to swoop on a push to mid-off from Brathwaite, he releases quickly but I think Hope was home even if he had hit with the throw. Broad is bowling with good pace and rhythm, but no breakthrough yet for England. "There's no zip there from Jimmy. If he's going to bowl like that then it is a long way for England." Brathwaite is looking busy here. He works two away past short leg and then smears a slightly mistimed pull shot, which a sprinting Moeen manages to keep to three. James in Sevenoaks: All well and good saying a low scoring thriller like this that is done in three days should be the norm but most cricket boards will take dull run fests over this type of match and having to reimburse day 4 and 5 ticket holders every day. Hope immediately gets off strike via a leg bye. Broad gets one to duck back in and rap Brathwaite on the pad, but it looks high. Alastair Cook has to tell a pouting Broad that he can't have a review, like a forbearing dad telling his eight-year-old that he can't have that shiny new bicycle in the window. Brathwaite works a single into the leg side. "This will be a fascinating afternoon. Can England bowl West Indies out? That's the question. England will be on the attack and there's tremendous tension all around the ground."